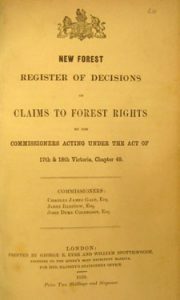 The New Forest Register of Decisions of Claims to Forest Rights published in 1858 is the handbook of who is entitled to what on the New Forest. In many commoning families it is regarded as the ‘bible’ of the Forest. 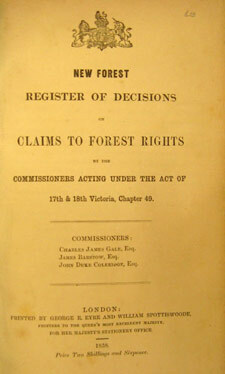 Following inquries into the management of all the Royal Forests a decade earlier it was decided that updating the register of claims would be an important part of valuing the New Forest. The 1848 inquiry concluded that a separation of commoners rights from crown rights would be of advantage to the crown. The deer would be removed and more land could be set aside for timber plantations. The book was one of the famous government ‘blue books’ printed by Eyre and Spottiswood for Her Majesty’s Stationery Office. The Eyre was George Eyre a member of the family still resident in Bramshaw who have been active for many generations in Forest affairs. One thousand three hundred and eleven claims are listed in the book, all are shown as either amended or disallowed. Apart from the claim number they give name, address and occupation of the claimant, the date the decision was made, the nature of the claim as amended and the size and location of the lands to which they refer. The claims are for common of pasture, turbary, mast, fuel wood, sheep and marl. The first is the most important today allowing the successful claimant to depasture ponies, donkeys or cattle on the Forest. The claim here by Joseph Short, Lyndhurst’s grocer, for tithe areas 209 and 177 cover the land now occupied by the car park and New Forest Centre. It looks as if the Centre could run ponies and pigs on the Forest for the right goes with occupancy of land and not the individual. This is also a reminder that for most people commoning was part of their way of life but not the only means by which they earned a living.